The Sunday Salon [1.29.12] – my books. my life. I missed my Sunday Salon last week when I was in St. Augustine without a computer and I almost missed posting one today since I’m out being a music video star. Well, not really. But I am out participating in my town’s lip dub music video. If you don’t know what I am talking about, check out this video from Grand Rapids. My town is doing its video to REM’s Shiny Happy People. Seemed like a fun way to spend a Sunday morning. Then, this afternoon, we are starting the house hunting process. I am totally growing up this year, huh? My reading life is progressing pretty well. 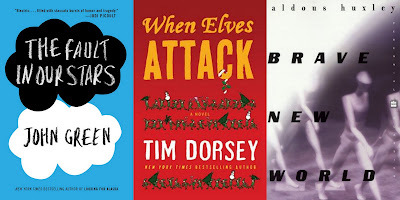 I finished three books this week: The Fault in Our Stars by John Green, When Elves Attack by Tim Dorsey on audio, and Brave New World by Aldous Huxley. 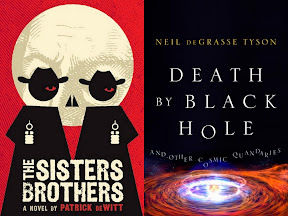 I am currently reading The Sisters Brothers by with Jennifer and Cassandra and listening to Death by Black Hole and Other Cosmic Quandaries by Neil deGrasse Tyson. Anyone else up to anything fun today? Or reading anything interesting? Or just generally want to leave a comment of some sort? What did you think of Brave New World? I just read it this past fall for banned books week. Have fun house hunting!! Jim and I absolutely love doing that together. It gives us a chance to find all the fun design and structural elements that we would love to incorporate into our very own House of Dreams and plot out must-haves for when we move next, whenever that is. The town lip-sync music video sounds like a blast! Have fun and post pics if you can! I wish you lots of luck with the house hunting. I have bad memories of this activity, but that was back in a different economy. People kept getting into bidding wars with us over the house we kept picking. I’m back from shuttling grumpy daughters to things, and now am hoping to write a couple of reviews and maybe read. My son and husband are going to the Magic game so I am off the hook for dinner. My best friend just bought a house, and it is as Sandy says, she kept getting her hopes up on a place, and then someone would outbid her. Usually it was one of those people who buy houses as investment properties and then fix them up for resale. But she found a beautiful house for a great price, and will be moving in the day before my birthday! Care to guess what I will be doing for my birthday? Here’s a hint: It involves lots of boxes and organizing! I wish you lots of luck with the house hunting. Maybe you will move closer to me! Nick and I are also house hunting. I’m finding it very stressful because I have a hard time keeping my hopes down and Nick and his dad find something wrong with EVERYTHING 😦 But we have a pending offer in, so I should be glad of that. I was away all weekend and feel totally disconnected! It feels good to be back checking up on my Google Reader! I am hearing wonderful things about the new John Green, I must get my hands on a copy!